Mathieu Bourdeau gets a first center referee assignment of the 2016 MLS season in an action-packed Week 7, officiating D.C. United’s game with Toronto FC. Jose Carlos Rivero will be on fourth official duties there, with Craig Lowry and Oscar Mitchell-Carvalho running the line for the Canadian, who turns 36 a week on Sunday. Three games took place on Wednesday night with Robert Sibiga, Dave Gantar and Juan Guzman overseeing those, and the three on-duty fourth officials – Nima Saghafi, Daniel Radford and Alejandro Mariscal – all feature again in the weekend match-ups. Saghafi is fourth in the Friday game between Houston Dynamo and LA Galaxy, supporting referee Mark Geiger at the BBVA Compass Stadium, while Radford and Mariscal return on the Saturday. The latter joins Drew Fischer, Mike Rottersman and Claudiu Badea in Seattle, while Radford is in Utah for Real Salt Lake – the only undefeated team in MLS – versus Vancouver Whitecaps. MLS All-Star referee Ismail Elfath takes charge of that one, accompanied by ARs Brian Dunn and Eduardo Mariscal. 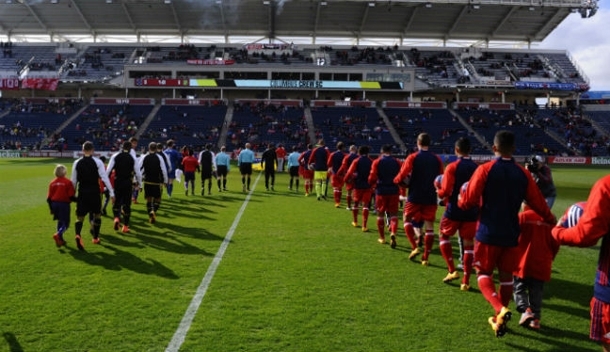 AR Peter Balciunas came under the spotlight in PRO’s latest Play of the Week, and he takes the flag opposite Kyle Longville at Toyota Park, where Chicago Fire meet Montreal Impact. Kevin Stott has the whistle there for what will be his second assignment of the season, while Ted Unkel and Chris Penso will both make a fourth appearance, at Columbus and Portland respectively. There are two games on Sunday, with Baldomero Toledo taking charge of Orlando City against New England Revolution, along with Kermit Quisenberry, Kevin Klinger and Rubiel Vazquez. Week 7 comes to a close in Texas, where 2013 MLS Referee of the Year Hilario Grajeda is in the middle for FC Dallas’ home clash with Sporting Kansas City at 7pm ET.